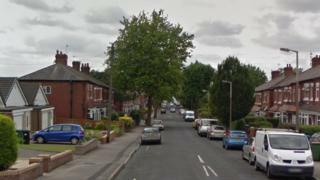 A two-year-old boy was shot with a pellet gun while he was in his pushchair, police believe. His mother was getting him out of the pram in Reddish, Greater Manchester at about 16:20 BST on 25 June when she heard two popping sounds. The child screamed and his mother saw blood on his right hand but assumed it had become trapped in the pushchair. After taking him to hospital, she noticed a small metal pellet in the bottom of the pram. Police now believe the child was shot with a pellet gun and are appealing for information. PC Matthew Beaden, from Greater Manchester Police, said: “We are treating this incident extremely seriously and are following several lines of enquiry.